Information just came out that you all should be aware of whether you are homeowners or tenants. All of these charts I got from Zero Hedge which came from the Census Bureau. I've been in the real estate business for over 20 years. That's long enough to have witnessed what a 'normal' or un-manipulated (less manipulated at least) market looked like in the early to mid 90's, the insane boom that happened through the first part of the 2000's and what happened with the market collapse of '08 - '09. So where are we now? These charts will be an eye opener to those of you who are not involved in this industry from day to day. In my neck of the woods, along the Wasatch front in Utah, there has recently been an onslaught of construction of apartments, condos and town homes. 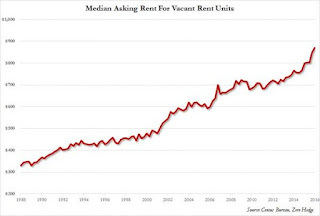 The vast majority of them are rentals. I manage of few dozen of them myself. The quantity and breadth of these construction projects all along the I15 corridor for about, oh I don't exactly know, 100 miles or so, is staggering to me! And most of them have been under construction at the same time! I can not begin to comprehend where the need for all of these rentals came from so quickly! One would think that with all of these rental properties being built at the same time that competition would be fierce and rental rates would drop as these building owners and property management companies compete for a limited amount of tenants. Nope! That's not what I am seeing here at all. As these charts show, rental rates continue to rise. Not only here in Utah but all over the nation. Once again I am at a loss. This reminds me of another time. During the early to mid 2000's I was also at a loss as to what was happening with land and home prices. From the early 90's to early 00's my Father and I ran a small land development business at which previously we were quite successful at developing larger 'luxury' lot subdivisions as well as starter home lots for tract home builders. During that period prices were rising so fast that we couldn't buy anything! We were being out bid by other developers, and not by a little bit. Everyone who had or knew someone with a piece of land got into the development business. This forced us out of the business. One would think that with such a hot market we could have done very well. To keep it short, we didn't understand what was happening and it hurt us. But at least we didn't get caught with a lot of inventory when the crash happened. During this time I was very confused and in complete amazement at what was going on. I didn't get it. After the economic downturn, recession, housing crash, whatever you wanna call it happened the light in my head finally went on. I realized that I wasn't the one who was crazy. It was in actuality everyone else that fueled the insane rise in the real estate markets which eventually lead to the crash who were crazy. You wanna see crazy?! THIS is crazy! As the Zero Hedge article indicates, this is where the inflation is hiding! 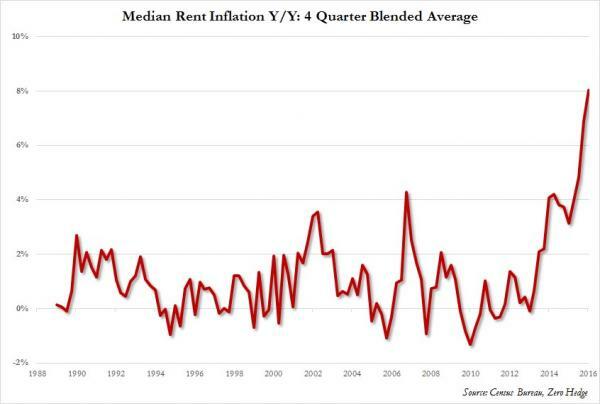 Rental rates have been climbing much faster than are reasonable. I have been a first hand witness to this insanity. 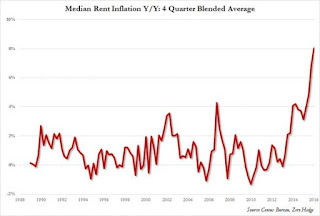 Before the crash the inflation was found in the single family home market and now it is found in the rental housing market. 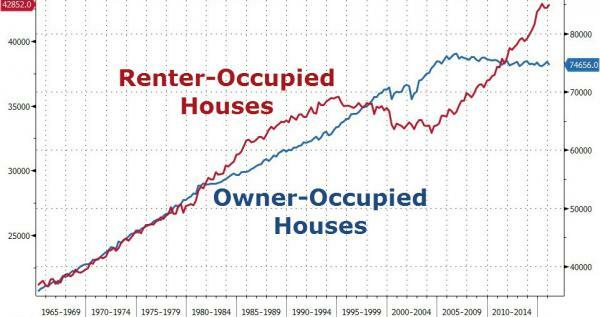 These two charts show the result of the housing crash of '08 -'09. Home ownership began to decrease and rentals increase, but at a much sharper curve than the decline in home ownership. Where did this come from?! Look to the student loan bubble maybe? The increase in government housing assistance programs? The increase in refugees and illegals maybe? This is just my speculation. 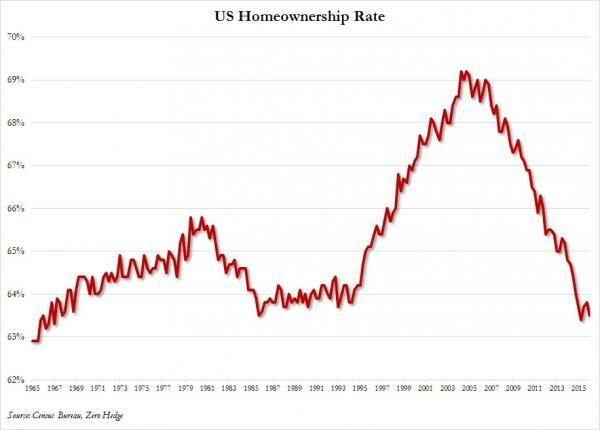 Part of the "American Dream" has been the dream of home ownership. These charts show that part of the American dream is no longer available to many families or they no longer have the desire to become a part of the American dream. Again, why is that? Is the economy not as good as our government says it is? (No speculation here, It just isn't.) These extremely low interest rates don't seem to be making as much of a difference as they used to. What happens next? Well, just like the previous housing market boom didn't last, neither will this current boom, this insanity. The last crash was felt most by both the individual homeowner as well as the speculator. What that means and entails this time around I don't exactly know, but it can't be good. A glut of vacancies and a sharp decline of rental rates? Most definitely. Owners of these rental properties defaulting on their loans? You bet! Many would have you believe that this will mean more opportunity after the next crash. Personally, I don't think so. I won't elaborate but if you are curious about what I really think send me a message and I'll share my thoughts with you. 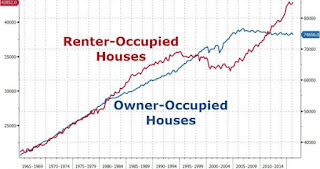 Additionally, what is also very troubling to me at the same time, which is not shown in these charts, is that I see the exact same things happening as did before the housing market crash of '08 - '09. Home prices have again gone through the roof and have spiked even more so recently. In my view they are again overpriced just as they were prior to the housing market crash. I'm not an expert at these kinds of analyses. I am simply sharing what I see going on in the markets as an active real estate professional, and prepper. New housing starts are down 7% and 8% nationwide the last two months in a row. The ultra high end luxury apartment and homes market has taken a turn for the worse in places like New York and California. These are the areas and the markets where it all starts. Take note. As Zero Hedge indicates in their article the current home ownership rate is near a 50 year low. Another part of the American dream is that our children should live better, more rich lives than the generation before them. With fewer and fewer people and families living in a home that they own themselves this is becoming more difficult and less of a possibility. So, what do I tell my clients about all this? I continue to believe in home ownership. Not because I make commission but because home ownership affords so much more freedom and pride than just being a tenant. A home is not an asset and debt is not a tool. Don't buy them for that reason, especially now. Financing is as easy to get now as it ever will be. Although home prices are inflated there is no time to wait to buy a home. Don't speculate, don't buy too much house. Buy a home you can easily afford where you can stay for a long time if necessary. Every family needs a roof over their heads that no one can take away. There is nothing like the freedom, pride and security that comes with home ownership!